Keoki Kerr reported that all of the Hawaiian-Language Newspaper pages will be up online and word searchable, “by the end of the week”! And he stated that we should check awaiaulu.org for more information!! Just two more days (November 28, 2012) before 15,500 pages of word-searchable Hawaiian-Language Newspaper pages are scheduled to go online! The work by more than 6,500 people worldwide, many of whom had no Hawaiian language ability, should be something to see!! Check Ike Kuokoa for more information. Hopefully all of the pages of Hoku o ka Pakipika and the first year of Ke Au Okoa that were done years ago before this volunteer project will finally go up as well! One more week, and 15,000 pages to go up online! 2012. One week and counting, (November 28, 2012) before 15,500 pages of word-searchable Hawaiian-Language Newspaper pages are scheduled to go online! The work by more than 65,000 people worldwide, many of whom had no Hawaiian language ability, should be something!! See Ike Kuokoa for more information. Oina Alama to Miss Mabel Cordes, Nov. 7. Roy T. Brown to Alexandria K. De Fries, Nov. 11. To Ching Sun Akana and Mikala Kepaa, a daughter, Nov. 1. To Louis K. Aiu and Henrieta Apa, a son, Nov. 3. To Willie Adolpho and Annie Kawika, a daughter, Nov. 3. To William H. Crawford and Hattie Keanu, a daughter, Nov. 4. To John N. Kalaukoa and Bella Souza, a daughter, Nov. 6. To Sam Auna and Elizabeth Keola, a son, Nov. 9. To Charles Brede and Julia Kealoha, a son, Nov. 11. To Jackson Kaapuiki and Henrieta Kala, a son, Nov. 12. John Alapai, at Camp No. 2, Nov. 6. Kalei Mahuka, on Ilaniwai Street, Nov. 6. Kealoha Halemano, on Muliwai Street, Nov. 7. William Kaeo, on Marmion Street, Nov. 8. Manu Naaiawahia, in Manoa, Nov. 8. Baby of Mrs. Charles Brede, on Alapai Street, Nov. 11. Haiola, at the Insane asylum, November 11. Charles Mahu, at Queen’s Hospital, Nov. 12. 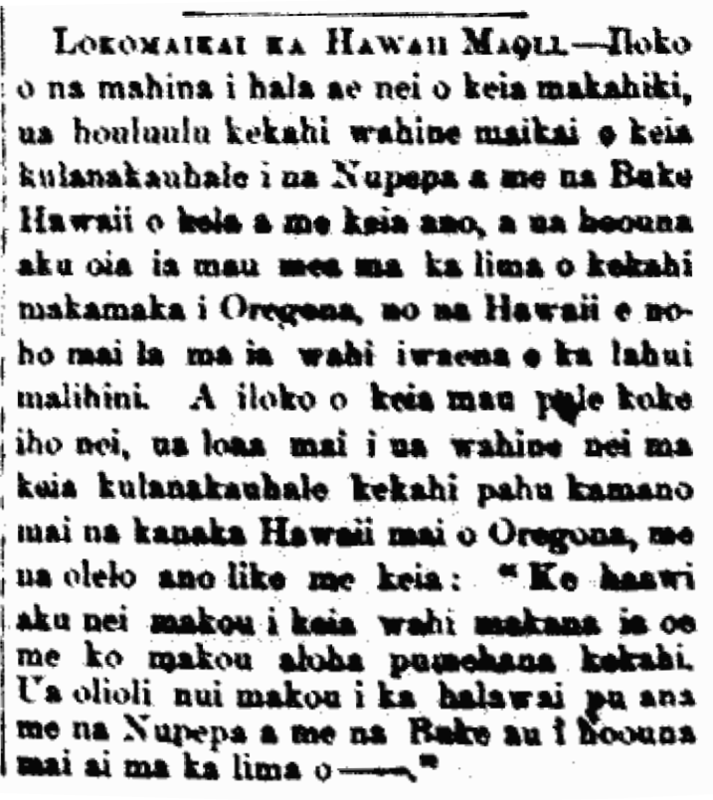 Ka Nupepa Kuokoa, Buke XLVIII, Helu 46, Aoao 8. Novemaba 15, 1912. 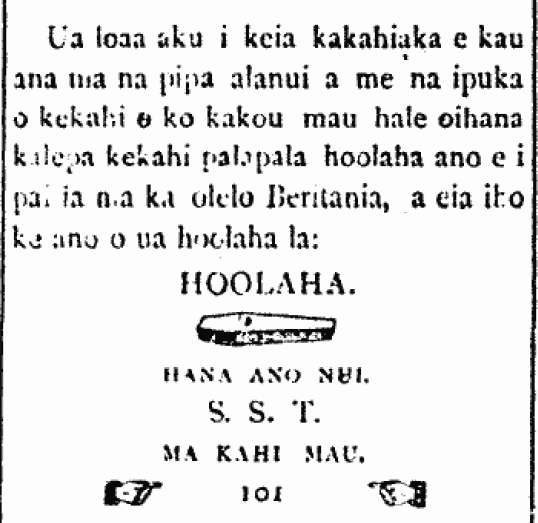 Ka Nupepa Kuokoa, Buke XXVI, Helu 49, Aoao 3. Dekemaba 3, 1887.